After a brief flirtation with wallpaper a couple of years ago I recently ripped all of ours down in a desire for a return to minimalism, but these new designs from Mineheart could convert me all over again. Their white cast iron lace wallpaper is inspired by decorative metalwork and gives the look of exquisitely ornate fretwork, almost like giant panels of three dimensional lace. It can be used to create a light romantic feeling and is strangely reminiscent of weddings, tea rooms and old fashioned conservatories. The Chesterfield design has the appearance of soft padded leather. It creates a seriously luxurious feeling and is evocative of a gentlemans club, boudoir, (or perhaps alternatively... depending on your point of view.... a mental institution!) 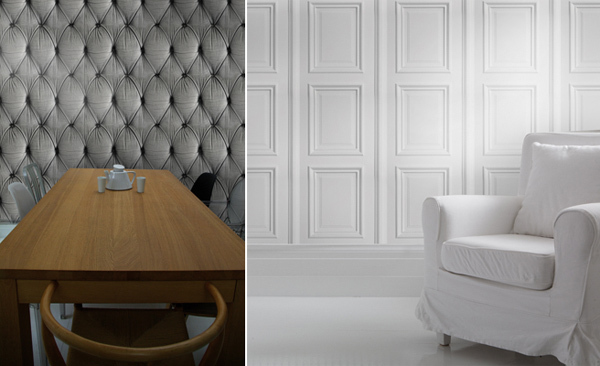 Alternatively opt for white Georgian style panelling to give your rooms a bright elegant boutique hotel feel. The painted white wooden planks design (complete with nail holes - above left), is perfect for a minimal shabby chic look (think beach huts, holiday homes, magazine shoots) and the black wrought metal gate design (above right) is inspired by architectural ironmongery and the pattern has echoes of Moroccan design. Conjure up your very own Italian palazzo with 'Stone Angels', inspired by architectural details and renaissance sculptures. The range also includes a choice book designs - opt for the vintage library look or create the bright minimalist look of a designer office, fashion shoot or art gallery in all white.